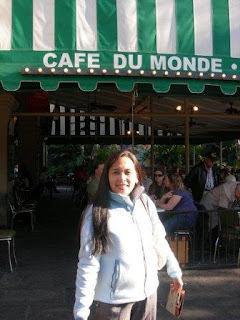 I became curious about Moonwalk, so we moved further until we reached Cafe du Monde. 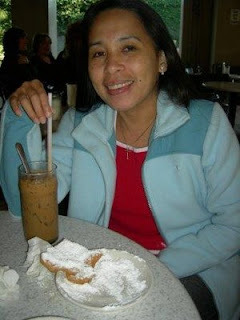 It’s a french coffee shop, so without a word, hubby was pulling me going inside and we ended up ordering a coffee and 6 pieces of beignets. He told me this is a famous coffee shop and well liked by almost anybody who would taste their french donuts (beignets) as well as the coffee. My hubby is a coffee lover, so I won’t wonder. I tried getting an ice decaf coffee and it’s sooo bitter…hehehe. 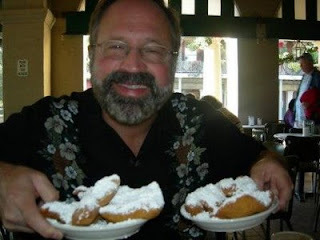 Hubby with the beignets (ben-yeys). He loves eating them. I ate one he ate five..lol! We spent few minutes sitting on the bench along moonwalk park. The park faces the Missisipi River, it’s kinda like Manila Bay. 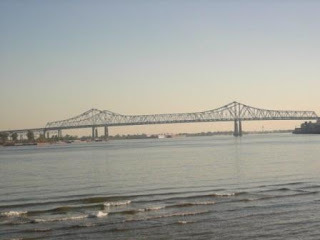 Below is a photo overlooking the Mississipi River. 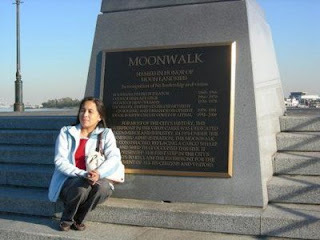 There are some spots where you can relax along moonwalk overlooking the bay. Be sure to take an extra jacket with you. It's cool and breezy out there not unless you're in the summer time with the heat at its peak.